Mark Pasternak of Devil’s Gulch Ranch caught the farming bug at an early age. “I was born and grew up in Los Angeles and hated every minute of it,” he says. His fondest early memory is of sitting on a pony at age two. When he was old enough to blaze his own trail, he moved north to Lagunitas, and in 1971 acquired a few acres of land in Nicasio that had previously been used for dairy cattle. He started raising horses and pigs, the latter of which became his gateway into commercial farming. Today, Mark and his wife, Myriam Kaplan-Pasternak, farm 115 acres in Nicasio, Novato, and Petaluma, raising pigs, sheep, and rabbits, as well as wine grapes and asparagus. Farming with such diversity evolved naturally over time for the Pasternaks—almost accidentally, in some cases. For example, Mark originally introduced the sheep as weed control, to graze his vineyards. “The meat was an afterthought,” he says. 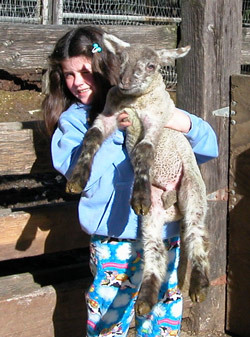 Grass-fed lamb is now one of the farm’s popular products in the spring. The rabbits started innocently enough, with two does and a buck. Myriam, who happens to be French and a veterinarian, was well acquainted with rabbit husbandry, so she thought the bunnies would make a great 4-H project for their daughters. Lean and similar in taste to chicken, rabbit is considered one of the more healthful and environmentally friendly meats out there, particularly well-suited for small-scale homesteaders. Rabbits are herbivores, of course, making them low-impact feeders, and because they breed like, well, rabbits, they can produce six pounds of meat using the same amount of resources it takes to produce one pound of beef. When the Pasternaks started raising rabbits, there were virtually no commercial rabbitries in the area. The rabbit meat that was available at the time generally came from out of state or from China. European-trained Bay Area chefs had a taste for rabbit but weren’t putting it on menus because it wasn’t available locally. Devil Gulch now has about 300 breeding does, which are a mix of Rex, California, and New Zealand breeds. 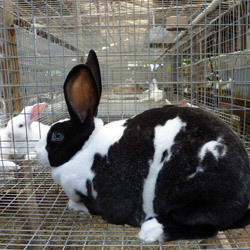 Rexes are known for the beautiful colors and velvety fur, while California and New Zealand rabbits are fast-growing, white-fur breeds, popular for their meat. “Raising rabbits is very labor-intensive on a commercial scale,” says Mark. Good sanitation is essential, as rabbits are susceptible to diseases like Coccidiosis. Mark explains that the large-scale rabbitries in Europe confine the animals in densely packed 12 x 12-inch cages, relying heavily on antibiotics to manage disease. At Devil’s Gulch, rabbits are raised without hormones and antibiotics. Each breeding doe is housed in her own 30 x 30-inch cage in a barn, and babies are kept with their mothers until they are weaned. Little goes to waste on the farm. The rabbits’ manure, a powerful fertilizer that is high in nitrogen and phosphorous, is applied to the vineyards. The rabbit livers and kidneys are sold along with the meat, while parts that cannot be sold are fed to the farm’s guard dogs. Pelts and other parts of the rabbit are made into products like rabbit’s foot keychains, cat toys, ear and hand muffs, and hats. The ranch’s heritage pigs, which are Yorkshires crossed with Durocs and Berkshires, are also models of waste management. Their diet includes byproducts and returns from local producers, including whole milk, whey, tortillas, whole grain bread, and spent brewers’ grain. “We’ve made a conscious decision to take products that might otherwise wind up in the landfill and turn them into high-quality protein,” Mark says. The Pasternaks strive for sustainability in their energy consumption as well. For many years, the farm was powered by an off-the-grid windmill, and in 2004, Devil’s Gulch installed the first grid-tied windmill in California. The other half of the farm’s electricity is supplied by solar panels. In 1997, the couple opened up their farm to the community by starting DG Educational Services, offering youth education programs at the farm. They partner with the YMCA for a summer camp, where children connect with nature, interact with farm animals, and learn traditional skills and crafts like pottery, hide tanning, and fire making. Myriam, who has been involved in humanitarian work since the 1980s, began growing their educational programs internationally. 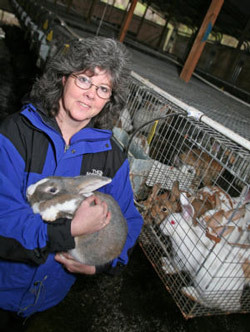 She started working with families in Haiti in 2007, helping them learn how to raise rabbits for income and food. In the last few years, the Pasternaks have also been importing coffee beans from Haiti and facilitating workshops to help coffee farmers rebuild their economy sustainably. Back at home, Mark is excited to be joining the Ferry Plaza Farmers Market, where he will be offering pork (including bacon and sausage), lamb, rabbit, quail (raised by a local co-producer), pelts, and other fur articles. He is eager to engage in the conversations that their unique products will undoubtedly stimulate. “I’m looking forward to interacting with the diverse crowd that goes to the Ferry Plaza and seeing what kind of response we get from folks,” he says. Find Devil’s Gulch Ranch in the back plaza at the Ferry Plaza Farmers Market on Saturdays. Photos courtesy of Devil’s Gulch Ranch.